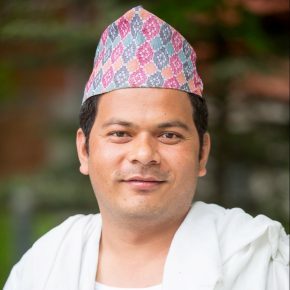 Brijlal is a social entrepreneur dedicated to enhance the standard of living of the marginalized and impoverished communities of rural Nepal. He is passionate about wealth creation by collaborating with community members. Brijlal is currently pursuing a Masters in Public Administration at Middlebury Institute of International Studies, in Monterey, California. Brijlal has five years of experience in running a youth based grassroots NGO called Sano Paila (A Little Step) in southern Nepal. He works as Chief Operation Officer and oversees eight different projects that are focused on providing justice to the marginalized population and integrating them into the life of the nation. He is also running Paurakhi Saving & Credit Co-operative Society Ltd. and providing access to financing for the rural population. He also aims to provide asset loans to the farmers in his village and eventually scale up this idea. Currently, he is testing Systemic Rice Intensification (SRI) method this year on his own land and will expand this idea and encourage farmers to adapt this modern technology that will reduce the input costs and doubles the productivity. As a result of his strong interest in agriculture, he started Prakriti Krishi (Agriculture) Farm where he rears goats, fish and grows mangoes. Brijlal is also passionate about educating the marginalized youth populations (especially girls) by providing them with scholarships to attain higher education and building libraries in the government schools in rural villages. He is already running two libraries and supporting 10 students. Brijlal aspires to advocate for a demand driven inclusive development. He seeks to represent the voice of the developing countries on the global stage and encourage the world to open up the markets of developed nations for produce coming from developing countries. He wants to advocate for an inclusive path for all who are marginalized and share the fruits of globalization.